This discussion is related to the Stats Box addon. I uploaded 1.5.1 with your changes. So ? 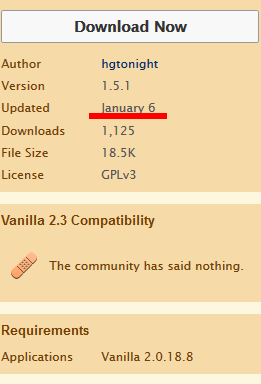 I don't understand what you are saying... hgtonight uploaded a new version and it had this problem on that line and that caused the fatal error. Do what you want. Fix it or don't . It's up to you. Thank you for your reply, but I do not understand what should I change. Plugin the already updated. THE PLUGIN THAT WAS UPLOAD UPDATED VERSION 1.5.1 HAS A MISTAKE THAT CAUSE A FATAL ERROR !!!!!!! This part of the code with the updated plugin. I give up... you must need glasses or are stubborn and refuse to read my comments. where I see the difference? I would guess that you are entering the age of need for reading glasses ? Welcome to my world ! !